Just got Mario Batoli’s Italian Grill cookbook in the mail. It’s beautiful and inspiring! I perused through the book over and over Friday night watching a bad movie – Vicky, Christina Barcelona (why did it get good reviews!?). I had the weekend menus planned, but I found myself having to pass a little time Saturday morning between picking up a rain barrel and going to the Historic Chicago Bungalow Greening Expo so I popped into a Whole Foods Market. Lucky me my memory was in high gear and I picked up some meyers lemons – they’re gorgeous – and some squid. I already had my lime leaves from our Little Siagon excursion last week which is for another story. Cover, put in fridge at least one hour. Wash Lime or Lemon Leaves about 4 leaves per skewer. Skewer according to photo – don’t pack tightly. Place on tray distribute any leftover marinade and salt LIBERALLY with kosher salt. Cover and let marinade another 30 min or so. Grill on hottest portion of the fire for 4-6 min on each side. 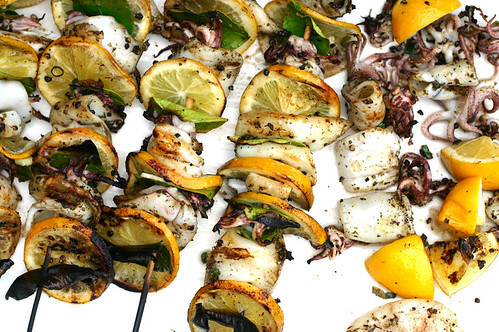 When finished drizzle with olive oil and squeeze lemon wedges over top. 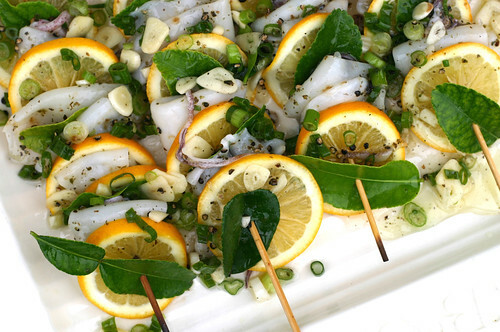 ALTERNATIVE METHOD: Skip skewering and grill on a flat grate with lemon wedges and lime leaves. Lime leaves are a must, Meyers lemons are not – regular lemons would be fine. Isn’t it wonderful when the brain works and you remember all the ingredients you need for a recipe? This looks wonderful and you did a great job on the pics. I will have to make this Friday night. Thanks for the inspiration!